Summer is here and with it comes new summer bridal fashion. While I have written extensively on bridal lehenga designers, today I thought let’s do pre-bridal, sister of the bride, and the wedding guest looks. Every other season, one gets to see new upcoming designer labels, and today I am sharing 5 Amazing New Designer Labels with you all. I just happened to come across this designer and boy oh boy, am I happy to find her or what. The price range is perfect. The silhouettes are quintessential summer wedding wear. Whether you want to wear an ethnic outfit to your bff’s wedding, or even your own prewedding functions. This designer has a great sense of style on a budget in store for you. Ok, so I agree this is not really wedding fashion on a budget. But if you’re looking for a new designer label to flaunt, this designer duo is a good name to keep in mind. Their collection has a lot of variation in terms of fabrics, styles, and colours. While this label has been around for awhile, I am sure to most of you’ll this might be a new name. The designs are very feminine, with light shades making it perfect for summer weddings. The full sleeves embroidered blouse lehenga sets cost much more than a crop top lehenga. So make sure you see both the options before making the right purchase. My favourite find in this blog post. Don’t you just love the colour combinations of her lehengas? Summer truly has arrived with a rainbow of colours to choose from her collection. Perfect to own as investment pieces to wear and reuse on multiple occasions. These lehengas can be worn anywhere from a morning wedding to a mehendi or a sangeet function as well. Looking for the perfect dreamy roka/engagement outfit? Check out this designer’s pretty collection. 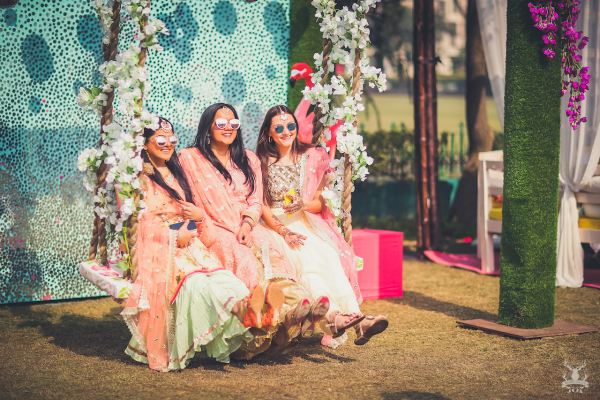 My favourites have to be the first two mint and pink lehenga and gown. What do you think of this designer’s style? In case, you are interested in buying any one of these lehengas from the 5 designers, you can shop them on Aza Fashions.